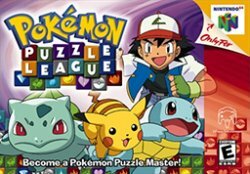 In the game, you get to play as Ash Ketchum on a side journey sent by Professor Oak where he is trying to become a Pokémon Puzzle Master. This is done in the 1p mode by defeating many trainers and characters of the animé in a VS style puzzle. There are 5 difficulties for you to play with, each of which mixes up the speed and block arrangement.